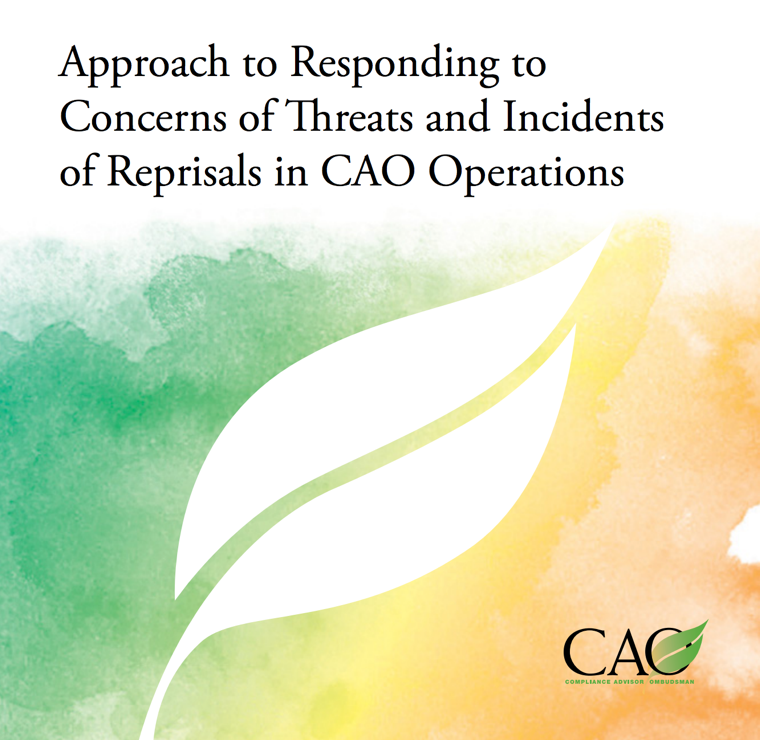 This year, CAO released its Approach to Responding to Concerns of Threats and Incidents of Reprisals in CAO Operations. The Approach sets out guidance for CAO staff and consultants on how to handle situations involving threats and incidents of reprisals targeting individuals engaged, or seeking to engage, in a CAO process. CAO developed the Approach in response to concerns voiced by human rights organizations about complainant safety and to address operational challenges in CAO cases. 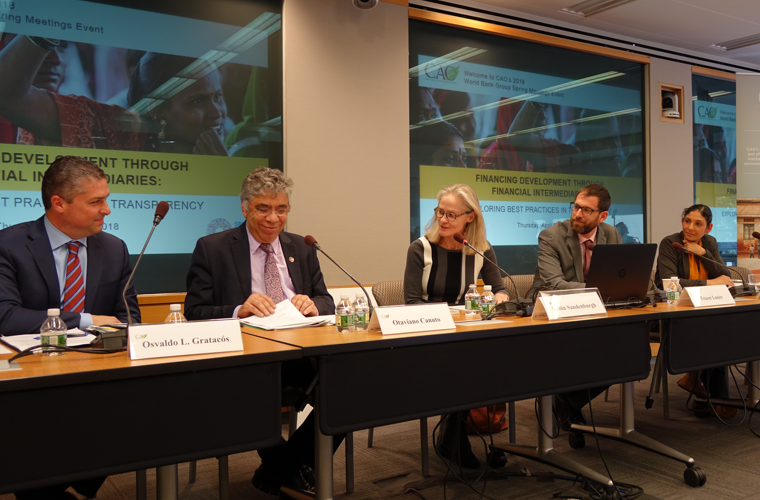 CAO formally released the Approach at a stakeholder roundtable during the World Bank Group Spring Meetings in April 2018, with special guest Zeid Ra’ad Al Hussein, UN High Commissioner for Human Rights. Following consultation and expert inputs, CAO started operationalizing the Approach in advance of the launch, conducting internal training with an external expert and developing guidance materials for staff and consultants. CAO Vice President, Osvaldo L. Gratacós (left), and roundtable guest of honor, Zeid Ra-ad Al Hussein, United Nations High Commissioner for Human Rights, Washington, D.C., April 2018 (CAO). In the Approach, CAO has committed to report information about threats and reprisals in its operations in aggregate annually. In FY2018, complainants in 23 percent of cases have shared concerns with CAO about reprisal risks. These reports were most prevalent in cases in East Asia and the Pacific (38 percent of the region’s caseload), followed by Europe and Central Asia (27 percent) and South Asia (22 percent). Threats were also reported in cases in Sub-Saharan Africa, North Africa, and Latin America. In the majority of reprisal risk cases (63 percent), complainants reported that threats emanated from government authorities. In 19 percent of cases, the alleged source of threat was the company, and in 18 percent, the source was another actor or was unknown. The Approach is available in English, French, and Spanish on CAO's website, www.cao-ombudsman.org. Different types of threats and reprisals were reported to CAO. People said they had experienced warnings, demotion, damage to personal property, and physical assault. Others reported being questioned at the workplace about the content of meetings with CAO. One person reported being followed and receiving anonymous phone calls. Retaliation risks were also reported to CAO in the context of outreach activities. Here, concerns were raised mostly by international civil society groups regarding the safety of potential complainants and safeguarding their confidentiality.